The Ottawa Senators will face the Pittsburgh Penguins in the Eastern Conference Final, marking the first time the two clubs have met in the post-season since 2013. On that occasion, the Penguins took the second round series 4-1. Pittsburgh is coming off yet another defeat of the Washington Capitals, but the series went the distance. The Penguins led the Capitals 3-1 at one point in the series, but wound up losing Game Five and Game Six to force a seventh game. 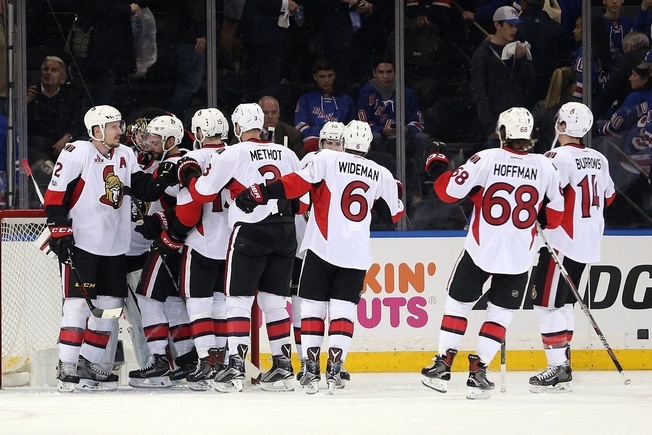 The Senators, meanwhile, defeated the New York Rangers in six games. They wrapped the series with a win at Madison Square Garden and are the more rested team, but they’re also the underdogs. Ottawa finds itself in the conference final for the first time in 10 years. The Senators are rather comfortable in the underdog role, though, and head coach Guy Boucher has flaunted it throughout the playoffs – even when the Senators have home ice advantage. It’s not inaccurate. The Rangers outscored the Senators but the Senators still won, while the Bruins were favoured in many circles. The Penguins, likewise, are favoured to win. Sidney Crosby is still at the top of the marquee for the Penguins. The 29-year-old has 14 points in 11 playoff games and is giving some viewers fits every time he takes a hit, but nothing’s going to slow this guy down. Crosby averages 18:15 of ice time a game and has 27 shots on goal, plus he’s proven a tenacity to charge straight into traffic areas. Jake Guentzel has 14 points in 12 playoff games, including nine goals. The rookie forward averages just over 18 minutes of ice time a game and has 26 shots on goal. He’s been able to find the right place at the right time and has three game-winning goals in the post-season thus far. Evgeni Malkin has been dangerous in every way, with 18 points in 12 playoff games. He averages 18:49 of ice time a game and leads the Penguins in points and assists. 25-year-old Bryan Rust has been solid so far, with five goals in a dozen playoff games. He averages 16:42 of ice time a game and has 24 shots on goal to emerge as a surprising secondary scoring threat for Pittsburgh. Ottawa centre Kyle Turris has six points in 12 games and has been a steady presence. He averages over 21 minutes of ice time a game and has bought into the Senators’ system, playing a complete team game. Turris is a good two-way player and that means he can help squeeze things up in the neutral zone, which can lead to counterattacks. Bobby Ryan has been excellent for the Senators, too. He has nine points in 12 games, including four goals. He had 13 goals in the regular season, just to put things in perspective. Ryan has also been blocking shots and playing responsible hockey at both ends of the ice. 24-year-old Jean-Gabriel Pageau seems to be the Bryan Rust of the Senators. He has seven goals in a dozen games, including a game-winner, and averages 17:43 of ice time a game. He has 30 shots on goal. Clarke MacArthur seems to be enjoying a resurgence of sorts, with six points in 12 playoff games and four points in his last two. He averages just 13:54 of ice time a game, but he’s making an impact. Depth has been an issue for the Penguins’ defence, as they’ve had to make do without Kris Letang. Now, they may have to make do without Trevor Daley as well. The blueliner missed Game Six and Game Seven against Washington and is a question mark as the series with Ottawa gets underway. That leaves a considerable hole. Enter Ron Hainsey, who has been averaging 20:45 of ice time a game and has four points. The 36-year-old is the epitome of a veteran performer, but the Penguins like his mobility and reach. Pittsburgh acquired him in February of 2017 and has to be happy with the way he’s embraced an increased role in the absence of two top defenders. Justin Schultz has been averaging 20:49 of ice time a game and has eight points in 12 games, including two goals. He’s been able to join the rush at times and can quarterback the power play. Brian Dumoulin will have to step up again, but that shouldn’t be a problem. The 25-year-old averages 21:01 a game and has two assists in these playoffs. The Senators would like to make the argument that defenceman Erik Karlsson is the best player in this series and, at this point, it looks like reasonable. He’s been electric through two rounds and will be ready for Game One of the series on Saturday. He plays nearly 29 minutes a game and has 13 points in 11 games, plus he’s capable of breaking things wide open with his brilliant passing. He’ll be tasked with covering Crosby, too. Cody Ceci has been averaging 24:43 of ice time a game and has just a point in 12 games, but he’s been steady and has helped the Senators slow down the opposition. Ottawa likely won’t ask him to alter things much, but he’s capable of making adjustments on the fly. Dion Phaneuf has five points in a dozen playoff games, but he’s gone without a point in his last four. He averages 24 minutes of ice time a game and has 19 shots on goal, plus he can still deliver a solid open ice hit. Marc Methot may have a score to settle with Crosby after the finger-slashing incident, but don’t expect the 31-year-old to divert from his game-plan. He’s averaged 21:30 of ice time and has two points. Marc-Andre Fleury has found a measure of redemption in the absence of Matt Murray. That’s in large part due to a reconstruction of his game, which has turned him into a more consistent netminder under the tutelage of goalie coach Mike Bales. Fleury has a .927 save percentage in the post-season and a 2.55 goals against average. Speaking of Murray, he’s healthy again. He dressed for Game Seven against the Capitals and that could make things interesting for Fleury. The added pressure could provoke a goaltending controversy if Fleury starts to slip. Murray is a confident and cool goalie, which means he’ll be ready to prove himself if he gets the chance against the Senators. Ottawa goalie Craig Anderson plays a style that relies on timing more than structure. He has a .914 save percentage and a 2.49 goals against average. He’s shown growth in many areas and can look over screens to see the puck, so the Penguins will have to get creative in order to generate chances. Mike Condon is the backup. The Senators acquired Condon from the Penguins in November of 2016. He’s seen about 20 minutes of ice time in these playoffs and allowed a goal on 10 shots. The 27-year-old was active in getting Ottawa to the post-season and came up big in Anderson’s absence. Yes, the Senators are the underdogs. But yes, the Senators can win from the underdog position. They’ve been doing it all along and they play a terrific team game that can put them in position to upset the Penguins. That said, it’s never a good idea to bet against Pittsburgh. They are among the most prepared teams in the NHL, with or without some significant issues on defence. They find ways to win. My call: Pittsburgh in seven.